In a bowl, combine flour, cheese, baking powder, sugar,, and salt. Cut in butter until crumbly. Stir in milk until just moistened. Knead on a floured surface for 1 minute; divide in half. Roll each portion into a 12 inch by 8 inch rectangle; cut each into 8 inch long strips. 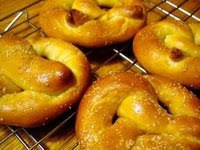 Fold strips inhalf, pinching edges, and twist into pretzel shapes. Place on greased baking sheets. Brush with egg and sprinkle with coarse salt. Bake at 400 for 12-15 minutes or until golden brown. Serve immediately. Makes 1 1/2 dozen. Yum! My son will LOVE these! Must try this week! My thoughts exactly! Doesn't look too difficult to make! Your pretzel looks so good. My hubby gila pasal pretzel with salt. He can eat the whole BIG pretzel in less than 2 minutes.